Implicit in some of my posts about "No Children in Space", is a story choice some American space fans probably find a little questionable, which is my decision to have Hiromi and Georgiana go up on a Soyuz launch vehicle which is (at least superficially) very much the same as today's Soyuz launch system and Soyuz-TMA orbiter. Why not an American spacecraft? Are we (as Americans) being unpatriotic? Is this some liberal PC "world peace" thing? Actually, it's deeper than that. There are three separate kinds of reasons that favor Soyuz: production, aesthetic, and plot. So let me handle those separately. We set this story in 2040. Originally, we were going to make it closer to 2020, but as we examined the backstory we needed to explain the "present" of the story, we found there was a little too much to fit into just 9 years! So we had to push back the date. But that has its own problems, because by 2040, the world will have changed in a lot of unpredictable ways, and we didn't want to get into a complex set of assumptions about world politics. Nor did we want to make the naive assumption that nothing would change (and wind up with the US-Soviet Cold War still raging in 2010, as it was in Arthur C. Clarke's 2001: A Space Odyssey, let alone 2010: Odyssey Two). I suspect the next star American system for transportation to LEO will be a commercial one. On the other hand, I don't really want to "pick the winner" -- which would be an extremely political act in today's climate. I did think briefly about trying to do a massive "product placement" campaign, but I don't know if we have the clout to get SpaceX or Blue Origin or Armadillo Aerospace or some other such company to pay us to use their system in our story. Nor do I really want our show to become an advertisement for them. I'm very excited about all of these companies, and I want to see space transportation become a vigorously competitive marketplace. More importantly, I suspect that whatever the next hot launch system is, it will not be the same system that is popular in 2040. Even if we don't consider the commercial options, though, the history of American space engineering has always been a serious of complete redesigns. The Space Shuttle looked very little like a Saturn V/Apollo, which in turn had only a passing resemblence to the previous Titan/Gemini and Atlas/Mercury systems. Constellation, if it ever gets built, is yet again another complete redesign. What this means for me as a science-fiction producer is that any American system I come up with will be pure science fiction. It is unrealistic to think that any American system running today will still be operating in 2040. Meanwhile, what are the Russian flying now? Soyuz. What were they flying 40 years ago? Soyuz. 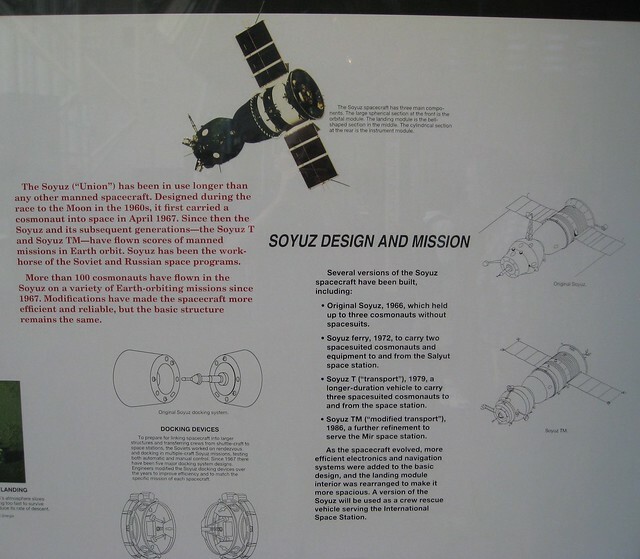 Certainly, to the trained eye, the Soyuz of 1967 was a very different creature from the Soyuz of 2011, and no doubt, the Soyuz of 2040 will be even more different. However, there's at least a plausible chance that Soyuz will still be flying in 2040, even if there are many other options available. Clearly, with Russia and ESA just completing work on a new launch complex for Soyuz-type launch vehicles at the equatorial launch complex in Kourou, the Russians are planning to fly some form of Soyuz for quite a few more years. It's likely there will more variation on the Soyuz orbiter, such as the relatively new "Kliper" design, but it's also pretty likely that some version of the original Soyuz orbiter will still be around. Soyuz is the only fully documented, existing spacecraft, which will plausibly still be flying in 2040. This is not intended as any kind of criticism of either the American or the Russian approach to space engineering. It's just an observation of a real difference in design philosophies, and from the point of view of minimizing our art design problems, Soyuz is clearly the more convenient option. Still, we could've gone with the science fiction approach and invented a launch system. Perhaps something that vaguely resembled one of the US commercial designs, but with a fictitious manufacturer. That would've worked, but it's undesireable for aesthetic reasons. First of all, it would immediately throw us into the realm of science fiction before we leave the Earth. This is conventional and a bit of a cliche by now. I would prefer to have that transition happen in orbit -- what I am saying by that is that _space travel_ is a present reality. _Settling the moon_ is the science fiction part. Secondly, and this is specific to the structure of the pilot episode, "No Children in Space", the Soyuz is part of a "progression from the past into the future" that we see on screen: we start with 19th Century technology -- a train (and we see Camels which hark back to an even older mode of transportation), we move on to early 20th century technologies of cars and buses, then to the spaceport where we encounter the late 20th century Soyuz. On orbit, we meet the early 21st century International Space Station (though it is known in the story as "Space Station Alpha" and has been expanded beyond its present design). We transition to the mid-21st century (and for Lunatics, "state of the art") "Lunar Transportation System". This is a statement about technological progress and continuity. Using an existing space transportation system for the Earth-to-LEO leg of the journey helps to sell that continuity in a way that I don't think we could get from any science-fictional launch system. There is one more aesthetic reason, too, which is that I don't feel anyone has done it well. The Saturn V launch was dramatized brilliantly in Apollo 13, and Shuttle launches have been well-photographed in real life and have appeared in more than one Hollywood movie. But the Russians have historically been secretive about their launches, and the modern coverage is still somewhat limited. As far as I know, no movie has really done justice to the Soyuz launch process, and as it is a really cool design, I think it would just be a fun thing to animate. While all of that makes sense outside of the story, I still owe you some explanation for why the choice was made within the story to for ISF to send Hiromi and Georgiana up on a Soyuz. Fortunately, this is not that hard to justify. The first reason is simple conservativism. Whatever the hot launch system is in 2040, it doesn't exist today -- and that means it will have less than a 30 year track record for safety. Soyuz, will be something like 75 years old. Assuming that the excellent Soyuz safety record continues, that's going to make Soyuz the vehicle of choice for nervous space colonists who are selecting a way to take their seven-year-old daughter into space. Also, from what I've seen from cabin video, Soyuz is a less-scary ride than some -- pretty gentle rocking compared to the fierce vibration the Shuttle SRBs generated. Coming down is a different story, but that isn't an issue for Georgiana. Secondly, the choice to launch Georgiana into space is a somewhat controversial one. In the 2040s, there will be some of the same voices decrying the "irresponsibility" of letting untrained people fly, especially children, fly into space. This would of course, be a media circus. Flying from a spaceport in the western desert region of Kazakhstan, with limited media access, not to mention going there by train (a decision they will not have announced), could be a good way to duck the paparazzi and the press -- or at least some of them. Finally, our backstory says that this Soyuz launch vehicle is essentially a "surplus" vehicle. This flight was promised to Anya Titova's satellite services company ("Silver Star Satellites"/"Sputniki Zvezda Serebryaniy") in a prior business arrangement. 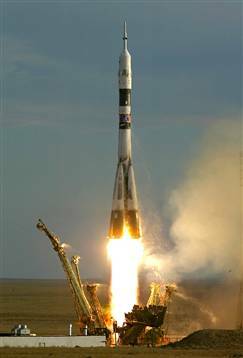 However, the aging Soyuz technology is no longer the preferred option for her satellite business and Anya, as both a colonist and a sponsor, has donated this flight to the project. Having said all that, the Soyuz in "No Children in Space" will be an evolved version of the system. We call it "Soyuz-SF" behind the scenes -- I would love it if somebody could come up with a plausible Russian meaning for the "SF" part, of course it really stands for "science fiction". Looking at the way the Russians have incorporated newer ideas into the older Soyuz design, I've considered some possible improvements that might be made -- more reusability, higher mass-ratio, and so on -- the sort of incremental changes Russian space engineers might be expected to add over the next 20 or 30 years. The orbiter will have a newer control panel and avionics system, so the interior will look somewhat different. Also, this particular vehicle will need special modifications to accomodate the small frame of a seven-year-old girl. Soyuz-TMA height requirements would not allow such a short person to fly, and Georgiana's spacesuit is not a Sokol-type suit. Instead, she is wearing a custom-made IVA/EVA convertible suit that has been specially designed as an ISF project to accomodate a child. This would all involve special training and equipment.